Leonard Fournette was suspended without pay for leaving the sideline, running across the field and punching Buffalo Bills defensive end Shaq Lawson. Fournette appealed, but retired NFL receiver James Thrash affirmed the one-game punishment that will cost Fournette close to $100,000. 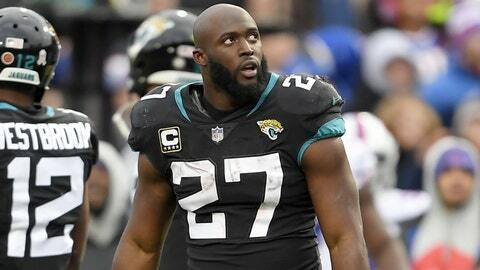 JACKSONVILLE, Fla. (AP) — Leonard Fournette‘s appeal of a one-game suspension for fighting has been denied, meaning he will sit out Sunday’s game against Indianapolis. The Jacksonville Jaguars running back was suspended without pay for leaving the sideline, running across the field and punching Buffalo Bills defensive end Shaq Lawson. Fournette appealed, but retired NFL receiver James Thrash affirmed the one-game punishment that will cost Fournette close to $100,000. The NFL and NFL Players’ Association appointed Thrash to decide appeals of on-field player discipline. Fournette and Lawson were ejected in the third quarter of Buffalo’s 24-21 victory and continued jawing at each other as they exited the field and entered the tunnel to the locker rooms. Fournette will be eligible to return to the team’s active roster Monday.